In 2010, the Middle East had no Fast Company or Inc. Magazine. Mainstream business magazines were stale, full of press releases, “industry reports” and indicators. Entrepreneurs in the start-up and growth phases often felt alone and disconnected, with hardly any locally relevant content. Wamda, which means “spark” in Arabic, had ambitions to become an entrepreneurial mega hub and to transform the entrepreneurial scene of the region along the way. Knowing that nothing great has ever been achieved by only sticking to the rules, our work on Wamda ushered in a new era at SYNTAX, where we transitioned from a design-led to a design and content led innovation firm. Developed, designed and delivered by SYNTAX, Wamda.com combines the content capacity of a business magazine, the community functionality of a social network and the educational resources of an online university. It was a complex mission in which we took many creative risks. We started by asking ourselves, how do we create a web interface at a time when the web is bringing together text, images, video, audio and increasingly reflecting the real-time life of people, companies and organizations? Driven by the client’s mandate to innovate, we threw out the manual of conventional web design. 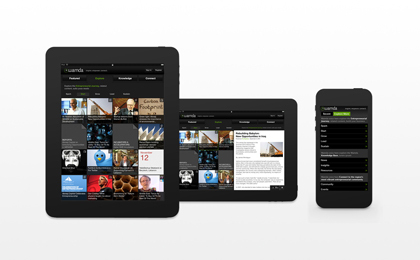 Navigation, content display, layout, sharing, authoring and connecting on Wamda have all been reinvented. We aggregated hundreds of feeds from blogs, Twitter, company sites and mainstream media outlets, bringing together some of the best minds of the region into one vibrant conversation. Building Wamda also brought together our various disciplines at SYNTAX and Spring in an unprecedented manner. Beside the strategy, branding, user interface design and technology skills, our team also developed Wamda’s content strategy, researched the sources of potential stories, coordinated the actions of various content and production partners and produced massive amounts of content in-house. Wamda.com was launched on 27 September 2010, during a two-day event called Celebration of Entrepreneurship, designed to consolidate, connect and motivate the region’s entrepreneurial community. The Wamda Live Stage, where in excess of 50 entrepreneurs, innovators, investors, government officials and SME facilitators were interviewed on camera, provided a realtime billboard for the site’s ability to capture the best regional content. But a website is a living being that can change and mutate. So with some user bewilderment borne out of unfamiliarity, and a lot of feedback from Wamda’s users, we worked iterations back into the product over a seven month period, to create a consistently more refined experience. Being born in the age of social networking and the real-time web, Wamda is more than a magazine and is broader than a website. It became a brand and an experience that represents the first comprehensive attempt to create an entrepreneurial media and conversation platform in the region.